We understand that there are internal and external factors that may be impacting your health and happiness. Although weight can be one such obstacle, it’s not our sole focus here at Your Wellness Center. The amount of weight lost is simply a quantitative measurement to guide and encourage you as you start seeing your overall quality of life improving. Your journey isn’t defined by a number on a scale, nor is it a diet that you’ll toss to the side after the program ends. The journey you take with us is about creating a sustainable lifestyle that nourishes you, your family, and your future. We start this sustainability by asking you for your “12 Reasons Why” – the big and little things that encourage you to be your best self. We strive to make sure you can check them off at the end of the program. Your success is what you want it to be! You don’t want to regain the weight and negative health conditions after the program, and neither do we! Together, we will create a sustainable, healthier lifestyle by the time your program ends. Many people trying to create a healthier lifestyle have people that look up to them: spouses, children, friends, family, even coworkers. By taking charge of your health and leading by example, you can inspire others to take steps towards their own happiness. Your energy, positivity, and confidence will be contagious! The easiest way to get started is to fill out a health history form. Our provider and dietitian will look over your goals and health history before contacting you to get your initial bloodwork scheduled. We also offer combination treatment plans. If your bloodwork shows signs of other underlying issues, we can combine your weight loss program with our Hormone Replacement Therapy. This will help you feel better quicker and see results faster. Plus, this may be an important reason why you gained weight in the first place. Is there a meal replacement program? Yes. For the first 2-4 weeks, we recommend using our Robard New Direction meal replacements to ensure your body can enter a healthy, fat-burning state. They provide 100% of the nutrients you need, so you still feel full and satisfied. This will cost $125-$150/week for the first month., and will be substituted for daily food so you won’t need to budget for other groceries. As you progress, you will need fewer replacements, and traditional food will be re-incorporated into your lifestyle. Our dietitian will guide you to make lifestyle changes that empower you to integrate a new, healthy meal plan into your life. Guidance can include the best way to discover new recipes that fit into your plan, navigating parties and restaurants, and incorporating exercise back into your life. 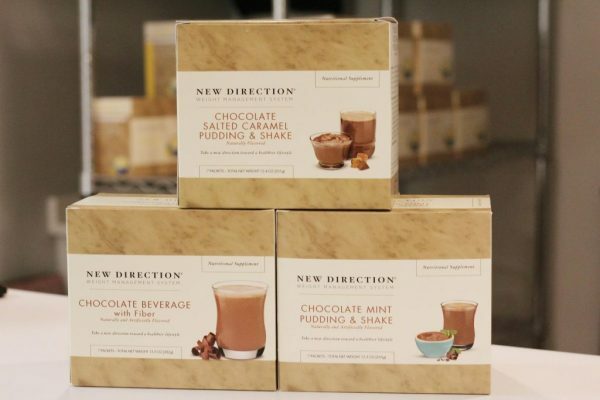 You can use the New Direction Recipe Book to spice up your meal replacements. Our dietitian also shares recipes over on our blog, so make sure you sign up for our Newsletter to stay in the know! You’ll visit us or a LabCorp near you for your blood draw 1-2 weeks before your first appointment with us. We’ll contact you to schedule your initial consultation with Dr. Lovett once we receive your blood draw results. You’ll meet with Dr. Lovett for the initial consultation. You’ll meet with our Registered Dietitian, Alyssa, for your bi-weekly appointments. * We require comprehensive bloodwork to determine if there are underlying health conditions affecting your weight and overall health. We often find many patients have an undiagnosed thyroid condition or low hormones that prevent your body from functioning at its optimal level. This decreases the chance that your body can process food and/or exercise the way it should. What’s included in the initial consultation with Dr. Lovett? What are the bi-weekly appointments with our dietitian like? Over the course of the “adapting” phase, you’ll gain an understanding of what the meal should look like in terms of macronutrients, portion control, and appropriate timing of the meal. As you progress, you’ll incorporate traditional menu planning, grocery shopping, and cooking that aims to provide steady weight loss or help maintain ideal levels. Once you feel comfortable, confident, and in control of your meals, you’ll graduate to the “maintenance” phase. At this point, you will have completely worked whole food meals back into your daily nutritional regime and will understand what your unique daily nutritional needs are in order to remain at your goal weight or to continue your weight loss journey. Each person finds that their weight loss success depends on how much effort they put into their journey. In the first month, women typically lose 8-15 lbs and men typically lose 12-20 lbs. We’ve helped people lose 200+ lbs, as well as 40 lbs, so no matter your goal, we can help you achieve it. If this sounds like you, it’s okay. Many of our patients feel alone in their journey prior to joining our program. That’s why we treat you like family: to give you guidance, support, and empower you to take back charge over your health. Programs include bloodwork ($299), an initial visit with our Board-Certified Physician in Obesity Medicine ($249-$299), and 6 or 12 bi-weekly visits with our dietitian ($780-$1450). If you choose to pay in full, there is a 10-15% off discount for the bi-weekly visits (no refunds). Meal replacements typically cost $125-150/week for the first month, then they decrease. Additional supplements may be recommended at minimal cost. Our collection of weight loss blogs can be found here.